We all know how important gun safety is, especially when it comes to your own. If you’re worried about your guns being stolen or a young family member getting their hands on one then this article is for you. A good quality gun safe is an absolute must! But as you may expect there is a plethora of sizes, security levels and capacities to choose from. We will cover gun safes for small hand guns, long-barrel guns and for different circumstances such as fire-resistance or concealing about the home. This guide will help illustrate the most useful features of each and comment on their best features so that deciding your purchase will be that much easier. There are things we should all look out for when choosing a gun safe. Some you might think are obvious but others, less so. Let’s go through that check list! First and foremost, your gun safe has to be secure. When we review safes we look for products that can’t be accessed by easily available and portable tools. So no hammers, hacksaws or pry bars will stand a chance. We also look at the types of access from fingerprint scanners to manual deadbolts. Biometric sensors can be quick and convenient but in the event of power outages or EMP they can’t be accessed. Fire safety is another factor. Everyone’s firearms collection is valuable so in the event of a fire breaking out you want to be confident that your guns will be safe. Any respectable product will have a minimum of half an hour’s guaranteed protection. There is also the internal layout to factor in – some safes give capacities based on the guns resting on each other which isn’t ideal for damage avoidance. Along with the internal layout, check for cubbyholes and straps which give you useful storage options for ammunition and accessories. Lastly, you need to consider the size of your collection – always buy bigger than you need in readiness for more firearms. These gun safes utilize their small profile to make them ideal for home defense and for distributing your armory around your property. We are going to briefly cover these handy items before moving onto the larger cabinets and safes. While most gun safes are produced with the homeowner in mind, it’s worth doing a call out for the Fast Box Model 40 which is intended for vehicle applications. This is suitable for trunks, cabs and automobile floors and its non-showy exterior doesn’t attract undue attention. For a full review if this model check out our best hidden gun safe reviews. The Fast Box Model 47 is a longer version of the Model 40 and is intended for use in the home or office. This slimline gun safe stores one firearm – complete with scope – up to 46.5” in length and, with its pre-drilled holes it’s a breeze to secure under a bed. Read our full review of this model. This single-door gun safe is ideal for hiding from prying eyes thanks to its modest depth of only 18”. The Answer safe eschews weight for strength, but don’t get us wrong: at over 200 lbs it’s hardly lightweight. Unlike cheaper safes that weigh more in order for you to think they are more secure, the Answer uses high quality materials and clever design to keep the weight down without sacrificing its security. If you choose not to conceal the safe, its exterior isn’t showy and it won’t attract too much attention. 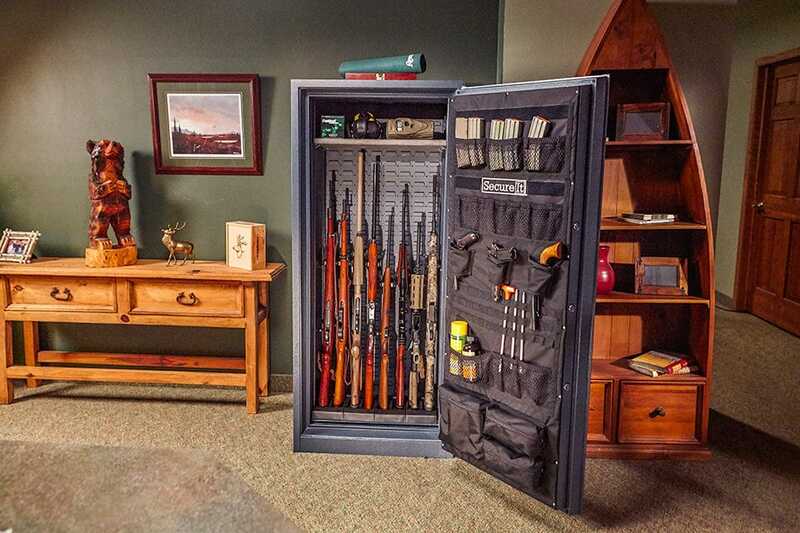 That’s one of the benefits of a serious gun safe like this. It looks every bit the professional and functional setup, especially with its black powder coated finish. The Ultralite is a tough, welded gun storage solution. It doesn’t have an internal drywall or a carpet that you may see on some models. As you may or may not be aware, drywalls and carpets account for the majority of instances of gun corrosion. Another common cause of damage to your guns is when they bump into each other in storage. 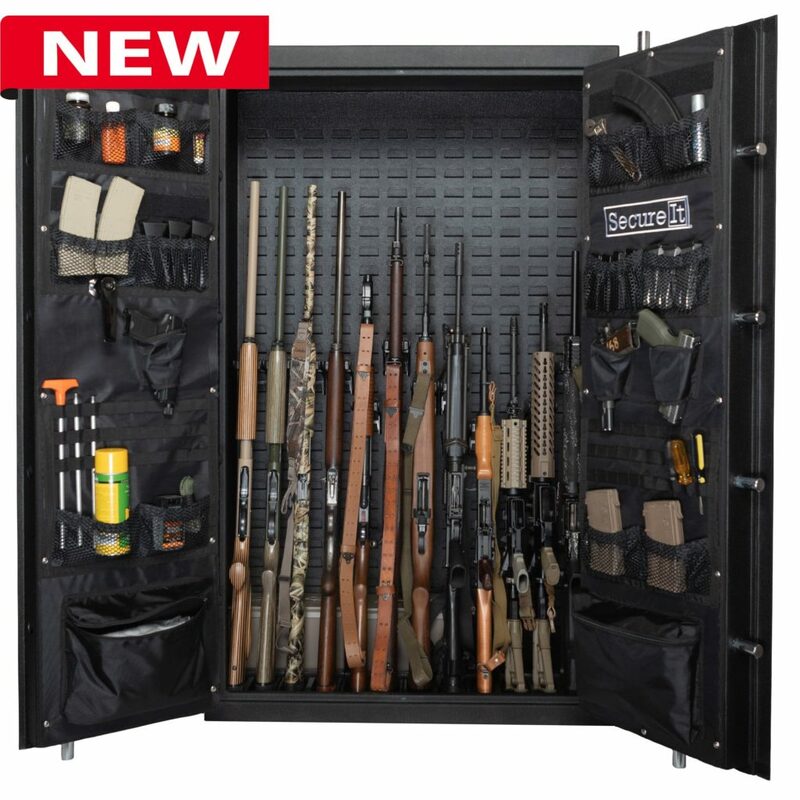 Thankfully Answer uses their CradleGrid storage system that was developed by Special Forces to organize firearms in an efficient and safe way. You can store eight long guns in here. Security-wise it features a SecuRam lock with keypad, 12 door bolts, and three heavy-duty hinges. An additional feature is a power hook-up you can use for installing lights for example. It has four mounting holes allowing you to add further units – this can be a handy way of increasing your overall capacity at a rate that suits you. The external dimensions in full are 59-7/8” (H) x 24” (W) x 18” (D) and its internal dimensions are 59” (H) x 23-7/8” (W) x 17” (D). Its assembled weight is 230 lbs. If you found the Answer Ultralite Gun Safe Model 8 appealing then its big brother, the Model 12, might be right for you too. Using a similar design, the Model 12 is a double door gun safe and a capacity of 12 guns rather than 8. It boasts the same slimline 18” depth so it’s ideal for placing within a closet. The twin door design gives you straight-line, easy access to whichever gun you choose. And each long gun is stowed safely in the CradleGrid system ensuring that your guns are well spaced and won’t knock into each other. Internally, as with the Model 8, this Ultralite has no drywall or carpet that could cause corrosive damage to your collection. There is an array of bins that can be purchased to alter and improve the storage options. For example you can opt for hand gun bins and convert your Model 12 into an impressive 24 hand gun capacity. Another conversion allows you to install 12 bins for a range of accessory storage including ammunition and tools. Our preferred choice is to have a little of both so you can have the full long gun capacity, space for at least six hand guns and ample bin storage to cover the most typical applications. As with the Model 8, this product is finished in a black, textured powder coat that looks the part. It has four mounting holes that you can use to attach a further Model 12 or a Model 8 or even build it into a closet. The 12-gauge steel body is secured with a SecuRam lock and 20 sturdy bolts with six heavy-duty hinges. The lock is of the electronic type but a key is provided too. The Model 12’s external dimensions are 59-7/8” (H) x 36” (W) x 18” (D) and its internal dimensions are 59” (H) x 35-7/8” (W) x 17” (D). Its assembled weight is a substantial 300 lbs. 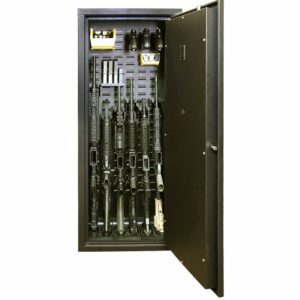 SecureIt’s premium gun cabinet, the Agile Model 52 is a heavy duty storage system that balances security with weight. Traditional gun safes offer the best protection but have the issue of weight. It’s always a two person job and can require specialist equipment. Not only that but you need to be sure your floors will take the load. Out of the gates, the Model 52 has the benefit of being self assembly – no worrying about how to maneuver your cabinet through your hall or doorways – simply build it where you want it. One aspect of this gun cabinet’s construction we love is that it exclusively features internal assembly so there is no way to open it up once locked. The assembly instructions are straightforward and it’s a fast build. The web site allows you to view the instructions online or to download so you can get a good idea of what to expect. Carrying on with convenience, the bespoke SecureIt’s CradleGrid storage gives you an adaptable interior that gives you tool-less adjustment to fit any long guns up to 50” in length, The louvered back panel gives you a quick way of inserting bins that can be used for a variety of purposes. The first can transform your six long gun capacity into a 24 hand gun beast. The second could give you a gun safe full of bins for storing and organizing your equipment. The Model 52 is one of those gun safes that carry the ‘straight-line access’ tag meaning that you can take out any gun without moving any other. This is a useful feature and one which helps keep your guns free from dings caused by neighboring guns. The owner also benefits from being able to take a quick visual inventory of their collection. Access to the safe is by keypad but there is also a manual key just in case you run into problems or a flat battery. The door’s hinge is piano-style with a triple point locking. We like the tight fit the door has with its frame; it’s not going to let anyone have an easy time breaking in. The Model 52’s dimensions are 52” (H) x 20” (W) x 15” (D) and it weighs 105 lbs. The depth is sufficient to store six long guns complete with their scopes attached. Deserving a special mention, the Agile Model 40 is a shorter version of the Model 52 and has been designed to stack on top of it. The giveaway is that its keypad is near the base so when it’s mounted on the 52 it’s easy to reach. Both this and the Model 52 have pre-drilled mounting holes to make it easy to bolt them together securely. If you are in need of more storage space you could even bolt a pair of 52s to a pair of 40s then link them as a quadruple unit! The standard specifications include storage of six long guns up to 38” in length, with the option of swapping this out with bins to store 24 hand guns or 10 accessory bins. It comes with three double stocks and six removable bungees fresh from the box. The Model 40’s external dimensions are 40” (H) x 20” (W) x 15” (D) and it weighs 90lbs assembled. At the top end of the market you will find products like the True Gun Safe. This is the pinnacle of gun safes and is intended for the serious collector or owner whose armory is very valuable (either financially or sentimentally). It’s also geared up to withstand fire for protracted periods, of which more, later. The robust structure of the True Gun Safe will put your mind at rest when it comes to concerns over theft and fire damage. Its body comprises two heavy gauge steel walls four inches apart filled with a cement composite that resists most cutting gear and insulates your collection from fire over an hour. 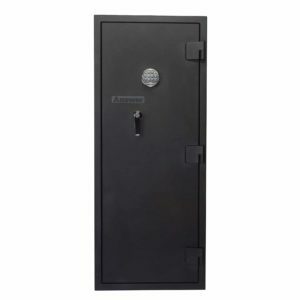 The width of the composite is 2.5” thick around the walls, floor and ceiling and, as you may be guessing, makes this one of the heaviest and most durable gun safes available today. Internally, angle iron beams are used to increase the rigidity and strength of this weighty creation. Let’s take a look at the door and locking mechanism; these are some of the best security set-ups you can buy. The door itself uses five active locking bolts made from hardened steel and three hardened steel plated deadbolts to firmly secure the door in the frame. To ward off against forced entry the True Safe has a couple of tricks up its sleeve. The first is the reinforced plate separating the locking bolt from the door plate to resist entry by drilling. The second is the independent relocking mechanisms that also help thwart drilling attempts. A feature that is standard on top of the range gun safes which we would like to see on any gun cabinet is the design of the hinges. If the hinges are forcibly removed there is no access to the interior. The lock is a smart, technological masterpiece in our view. It’s a Sargant and Greenleaf, Group 1 EMP-proof device that is guaranteed to let you in but keep everyone else out. S&G famously build some of the best safe locks on the market and have done for the past 150 years. Electromagnetic pulse resistance prevents this motor-driven lock being overloaded by a sudden high voltage. This one handles voltages of up to 50kV/m which is rather impressive! Entry is by a six-digit code which – with a bit of math – works out as a million permutations. A user can’t ‘brute force’ the lock code either since you only have three attempts before you would be locked out. As with its SecureIt cousins, the True Safe forgoes internal drywall and carpet to ward against damp and chemical damage. Your guns are mounted with SecureIt’s proprietary CradleGrid technology that grants you easy access to your firearms and is adjustable by hand. You also get the ubiquitous louvered back panel that provides a impressive range of organizational options. As standard the True Safe is supplied with eight cradles and detachable bungees and four twin stock bases to hold eight long guns. If you purchase the high capacity kit you can extend its generous capacity further, all the way to a staggering 33 long guns. 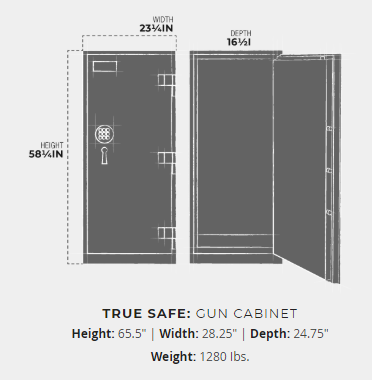 The True Gun Safe’s external dimensions are 65.5” (H) x 28.25” (W) x 24.75” (D) – it’s a substantial piece of kit. Its internal dimensions are 58.25” (H) x 23.25” (W) x 16.5” (D). You can see from these figures just how thick the walls really are and it’s very reassuring. Once assembled, the True safe weighs just shy of 1300 lbs; once it’s in place it’s going nowhere! 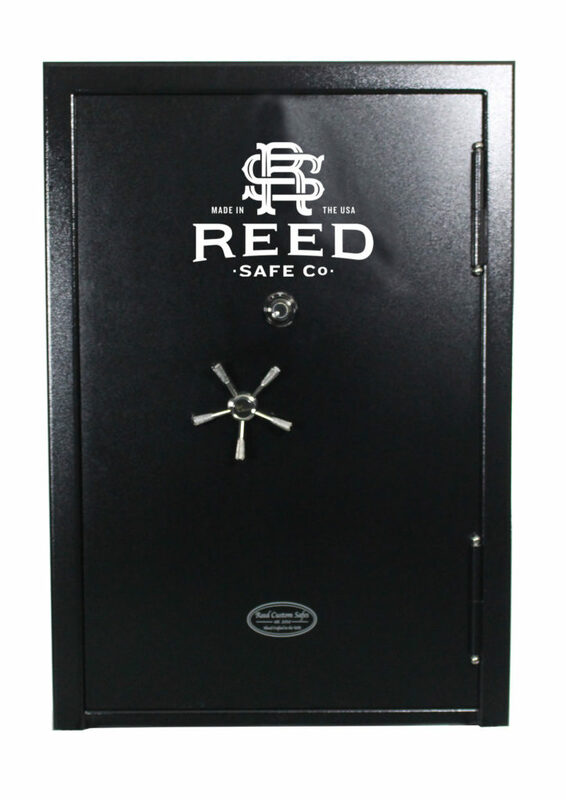 Commanding a higher price point, Reed’s custom safes easily delivers on customer satisfaction and security. 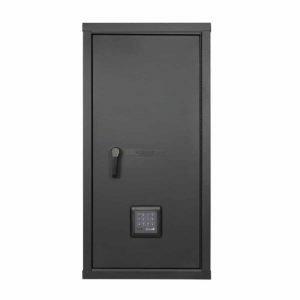 As the name suggests, this range of premium quality safes are built to order and there is a plethora of options you can select. Whether you want to opt for an exterior colored finish to suit your décor or choose your specifications for a bespoke internal layout, Reed has something for you. There are no fewer than 10 finish options for the exterior and 10 finish options for the door. Then we have 17 different internal configurations which give you an impressive array of storage options. For instance you could max the Model 5072’s long gun capacity to 40 long guns, 120 hand guns or a combination of 30 of each! Other options include the fun ‘His & Hers’ where the safe is divided into two vertical sections. The long gun’s maximum length is an impressive 63”. The body of the Model 5072 is 7-gauge (meaning 3/16” thick), 409 stainless steel (a hardened steel, stronger than mild steel). The door’s thickness varies in places from ¼” to ½” making it resistant to all but the most serious of attacks. There is an option for additional interior steel plating and an added plate for the door. Your guns are held snugly on vertical slide-out racks which are a great way of giving you access to any firearm without you having to move neighboring guns. They are spaced well apart so you don’t run the risk of accidentally damaging any of your collection. Each slider can hold 10 long guns complete with attached scopes. Alternatively each will carry 30 hand guns. The gap between the door and frame is one of the smallest possible making it all but impossible to pry. The door is secured by 20 solid moving bolts. The Model 5072 is rated to survive fire at 1,200 degrees for up to 90 minutes making it likely to survive the most serious house fires with your armory intact. The external dimensions of the Reed Model 5072 are 72” (H) x 50” (W) x 28” (D). Internally the Reed measures 68” (H) x 46.5” (W) x 21” (D), giving you a good idea of how thick its walls actually are. Its weight is an extraordinary 1,700 lbs and is the heaviest and, arguably, most secure on test.